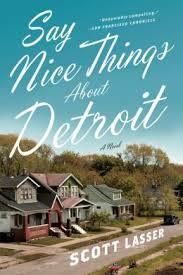 a book chick: "Say Nice Things About Detroit"
my take: As a born and bred West Michigan girl, I remember when we were moving to the Detroit area for hubby's medical education ... people told us to leave our television back in W MI ... might get stolen. Detroit gets a bad rap. Still. This title on the bookshelf stopped me in my tracks ... I do say nice things about Detroit after living there for nine years. Yes, the city is falling apart, but there are so many wonderful things about the place. I loved reading this ... it's a walk down memory lane and we only were there for a short time. The narrator grew up in the Detroit area and is practicing law in Colorado when his mother's dementia requires him to return to help his father. There's sadness and conflict - drugs, murder - and yet, and yet ... my one word description: hopeful. May the real Detroit find the redemption Scott Lasser has given it in this novel. 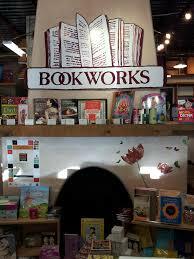 my source: a most divine Indie bookstore - Bookworks in Albuquerque, NM (could have spent all day there) - pictured below - next to a Flying Star restaurant - so a win win situation. my verdict: If you have lived in the Detroit area at any time - read this. Worth a read even if you haven't. Fast read. It seems that half my west michigan book club has roots on Detroit:). This is our Januany 2014 pick.